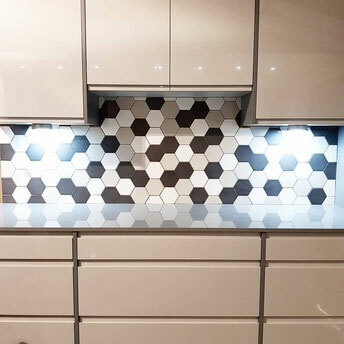 Take a look at a selection of our kitchen wall tiles. Don't forget, you can also use bigger tiles (e.g 60x30cm) to achieve a sleeker look with minimal grout lines. Check out our wall and floor tiles here. Lime, Turquoise, Papaya, Mango and Cherry. Bright, colourful tiles perfect for a splashback. Brick effect tile, rustic, matt finish. Also available in Taupe and Cream. Gloss Black, White, Dark Grey and Light Grey. Mix your gloss and matt finishes for something a little different! Blanco, Cotone, Fango, Greige and Ottanio. A rustic tile with a smooth, satin finish. Available in White, Cream, Linen, Latte, Biscuit, Mineral, Mocha, Pebble, Stone and Patchwork! A traditional tile that can be used on their own or mixed with other colours/patchwork patterns to create a unique look. The patchwork patterns come as an assorted box and are priced at £1.44 per tile. Available in White, Black, Light Grey and Dark Grey. A very modern look for either a kitchen or bathroom. Very effective - glossy and different! Available in Grey, Black, Red, Blue, Green. Many more available from our suppliers, including Original Style. A look that will always be classy and traditional. Available in White, Ivory, Cream, Mocha, Grey, Graphite and Black. Glossy brick effect tiles with a wavy edge. Perfect as a finishing touch to a kitchen wall. Available in Talco, Pomice, Cemento, Anthracite, Black. A stretched traditional metro tile with a satin sheen finish. Available in Black, Dark grey, Light grey and white. Something quite a bit different, this is sure to attract attention and create a great feature in a bathroom or kitchen. Natura, Bianco, Crema, Graffite, Nebbia, Nebbia Decor and Mare Decor Mix. Available in Aqua and Green.